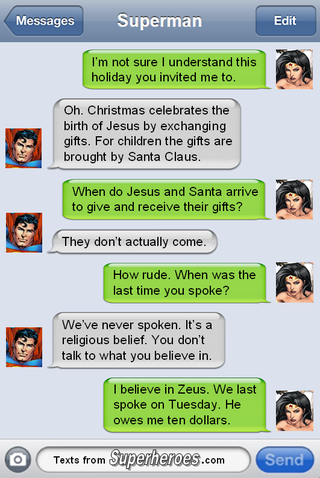 Religious celebrations on Themyscira must be a lot more interesting. The always delightful Texts from Superheroes has brought us another round of holiday goofiness as superheroes deal with their culture and personality clashes. Head over to Texts from Superheroes to find out what Superman gave his fellow Justice League members and relive some of the classic texts from Christmas past.